Even with so many legends to choose from, it’s no surprise that one of the most beloved among Yankee fans is Philip Francis Rizzuto. “The Scooter” played shortstop on seven World Champions and nine pennant-winners, capturing an MVP in 1950 and making five All-Star teams. A slick bunter and base runner, the 5’6”, 160-pound sparkplug was among baseball’s best with the glove. Rizzuto even inspired three-time 20-game winner Vic Raschi to say that his best pitches were the ones batters hit in the Scooter’s direction. After retiring, Rizzuto became the voice of the Yankees for 40 years, calling the action on radio and television. All the while, Rizzuto did it with class and style- making great moments more memorable and the not-so-great moments a whole lot more interesting. But even when record-breaking home runs weren’t being it, Rizzuto had a way of making a game special. Fans would always know whose birthday it was or where to get the best Italian cookies or where the day’s cannoli had come from. But one thing fans would never learn from Rizzuto was the first name of the Scooter’s broadcast partners. Like future National League President Bill White, whom Rizzuto simply called “White” and nothing more. “How would you like to work 18 years with a guy who still doesn’t know your first name?.” Bill White once asked. 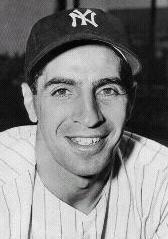 Rizzuto, after years of lobbying from his numerous supporters, was finally inducted into the Baseball Hall of Fame in 1994.